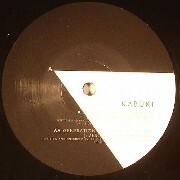 A) Kabuki - Just Hold On (House Mix From Marcus Worgull) B) Kabuki - Generation X (Eveson RMX) / 'Hold On' has been given the inimitable touch of Deep House master Marcus Worgull. A classically trained musician like Kabuki, he has stripped the track and used Jenna’s vocals stabs to create a exquisite minimal groove to stunning effects. Rising drum and bass star Eveson has been given 'Generation x' to remix, and his 'Ode To A Rave Generation' is exactly what it is: keeping the haunting synth loop throughout, slowing the track down to finally go back to a rave-friendly 140 bpm with vintage breaks, and making the most of Paul St Hilaire's colourful voice. The result is as awesome as Skream's recent 'Burning Up'.